As a student, you may have to decide between living on and off campus at some point. While both come with advantages, you’re likely to cut costs and immerse yourself in your community more if you choose the off-campus housing option. WsYOU/Bluff City Properties rents college housing in Winona to students and aims to help improve their lives through academic contributions. Our team strives to keep a variety of options for college apartments in Winona, so we continuously expand our offerings and create living spaces for a wide range of learners. If you prefer retreating into the quiet of a comfortable quarter, we have just the right college housing in Winona for you. Our single-unit communities for college apartments in Winona, “Shorty’s Greenhouse” and “Isabelle’s Lodge,” allow students to join the campus bubble while having a private, cozy living space just steps away from the campus. You can participate in the day-to-day activities of campus life anytime without having to take a long walk or drive. If you need to study, away from the distractions and hallway conversations of college dorms, you’ll be pleased to know our single-unit college housing in Winona offers ultimate privacy. This college housing in Winona also has a full bathroom, sleeping area, and kitchenette. Located in the heart of the Mississippi Valley, our “vacation-style” college apartments in Winona is for those who want to enjoy the picturesque beauty of the property for less. 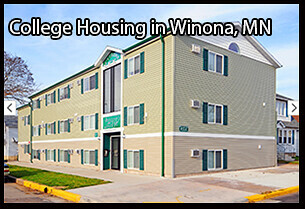 This college housing in Winona is less than 10 minutes from downtown Winona and the campus of Winona State University. Moving into our vacation-style college housing in Winona can help you cut commuting expenses and save time on walking or driving. We understand that some prefer personally seeing their potential college rentals in Winona before settling in. Students who want to tour our college housing are free to set up a showing with management. On the day of your tour of our college housing in Winona, management we’ll meet with you at our office located at 555 Huff Street. From there, we’ll go to the property so you can get a proper view of your preferred college housing in Winona. We are willing to give you a ride to our college housing in Winona if this would be more convenient for you or if you don’t have a car. Our management team wants your experience with WsYOU/Bluff City Properties to be as hassle-free as possible, which is why we’re here to lend a helping hand from start to finish. When you’re done touring our college housing in Winona, we can walk you through our lease information and the type of procedures to expect during the transaction. Our staff will be patient in addressing your concerns about moving into our college housing in Winona. We’d also be happy to answer you and your guardians’ questions about paperwork, deposits, and more. Once you’ve found the perfect college housing in Winona at WsYOU/Bluff City Properties, you wouldn’t want others renting it before you do. Luckily, you can avoid this by signing the lease or holding your preferred college housing in Winona for 48 hours. This costs $200 in total no matter the number of renters in your group. Are you ready to leave the dorm life behind and immerse yourself in communities outside your campus? Become a resident at WsYOU/Bluff City Properties today! Contact management to set up a tour or learn more about the best student housing choices in Winona.